This book with online audio and video presents tuning, proper positioning, basic chords (C tuning) and folk songs for strumming and singing. Very easy to comprehend even for the absolute beginner. The companion online audio in stereo play-along format and contains all of the songs from the book. The online video features Joe Carr teaching simple chords, strums, and songs. 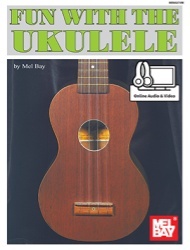 An ideal beginner's course for ukulele in C tuning. Includes access to online audio and video.